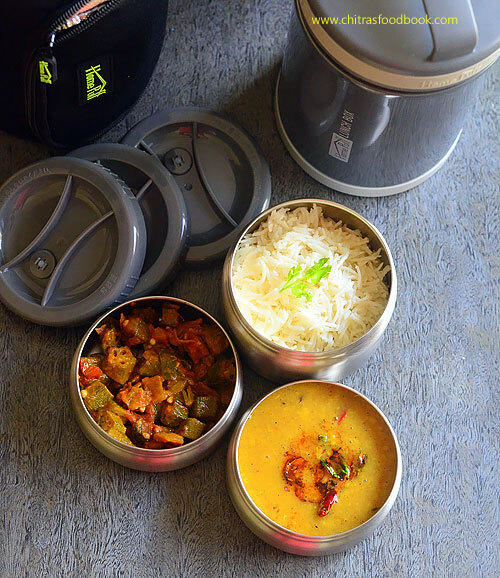 Last week I got Home Puff's Double Wall Vacuum Insulated, leak proof, Stainless steel Lunch Box of 1700ml capacity. I am sharing my reviews on this product after using it for one week. I have been using it regularly for packing Sendhil & Raksha’s lunch. Food stayed warm for more than 4 hours If you pack them really hot. I have tried packing Idli & sambar, Ven pongal, Sambar rice, Veg fried rice, Kuzhambu, Kootu, Dal tadka with rice and Veg biryani. Everything stayed warm for more than 4 hours. More over its completely leak proof which is a big relief for me. This insulated lunch box is much much better when compared with my old M****n steel lunch box. 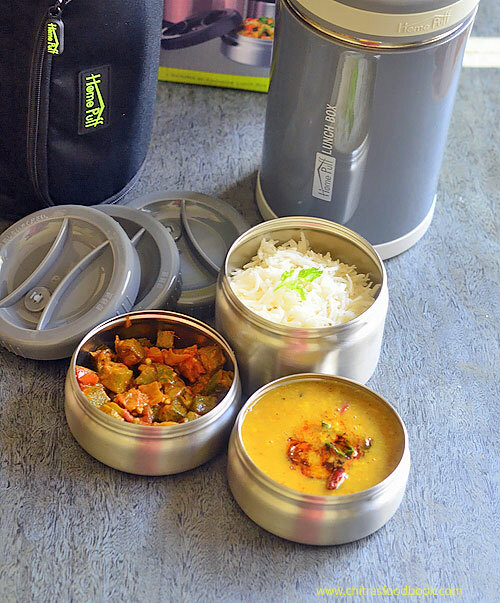 Friends, If you are looking for a good Insulated lunch box, you can go for Homepuff’s product. This product would be ideal for gifting too. I have also shared all the PROS & CONS based on my opinion. Have a look at them. Looks so good and professional. Its containers are with top grade stainless steel interior (304-Grade Stainless Steel) and exterior with Double Walled Vacuum Insulation for temperature control and durability over time. High Quality Lid with Silicone lining for heat insulation, BPA-free, non-toxic. 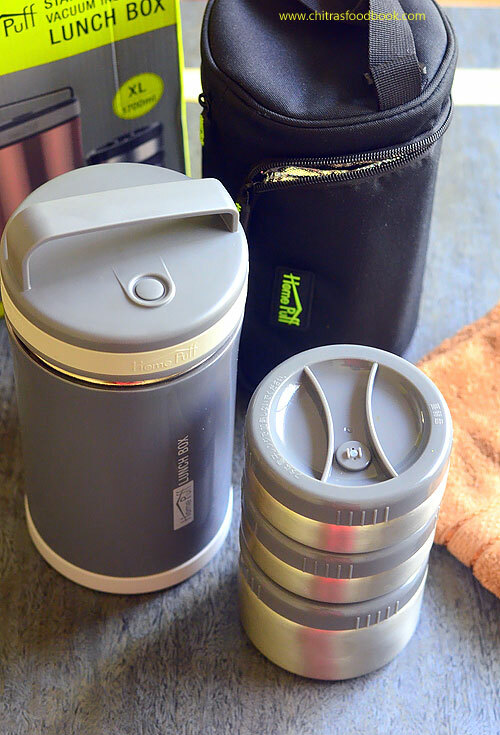 Well Designed with 3 separate Leak proof food containers with silicone gasket rings to keep dry and wet food hot in the same. I have tried packing sambar, Dal tadka as well. Easy and comfortable to handle with good grip. Easy to carry too. Every HomePuff lunch box comes with bag which unzips into a tablemat. This bag is made up of specially coated aluminium material which repels water and food stains. Quantity of food would be enough for one adult/ 2 children. Food stays hot for 2 hours and becomes warm for more than 6 hours. Similarly cold foods remain cold for 2 to 3 hours. Warranty Details : 12 MONTH WARRANTY UNDER MANUFACTURING DEFECTS ONLY. DOES NOT COVER PHYSICAL DAMAGE, LIQUID DAMAGE & BURNT DAMAGES. It would be better if there is some partition in one of the containers. It helps to pack more dishes. Please do not expect the food to be to hot. It stays warm around 60 to 70c upto 5 hours. You can find this product in HOMEPUFF.COM website, Amazon and Flipkart. You must visit their website to see their wide range of kitchen gadgets.